Despite the many benefits, like its durability, low-maintenance, and waterproofing capabilities, vinyl decking repairs and patches can be more difficult than wood or composite deck repairs. Unlike these plank-style decks, where you can simply replace a damaged piece or section, vinyl decking is a walkable waterproof membrane. This makes removing or replacing a damaged section more complicated. When your vinyl deck is damaged, rather than tearing out and replacing the entire membrane, you can heat weld a small piece of vinyl over holes, cuts, or discolourations. To create an effective patch, you’ll need a length of vinyl that matches the pattern of your existing deck. Cut the section square, leaving at least 1” of room between any holes and the edge of the patch when laid overtop. Make sure the surface is clean and dry before applying glue and using a heat gun to weld the edges of the patch to the existing vinyl deck. When you’re not worried about the aesthetic impact of a patch in your deck, and if the deck isn’t over living space, replacing a section of your vinyl could be the best option for you. Especially when your deck has been damaged by burn holes from barbecues or cigarettes and tears from patio furniture or tools, installing a new section of vinyl can be the most economical and effective solution. Now that we’ve got that out of the way, we realize that tearing out hundreds of square feet of vinyl for the sake of a small damaged section is something that you want to avoid if you can. For most vinyl damage, you can get away with spot repairs, as long as you don’t mind the look of the deck patches. There are some situations where replacing your vinyl decking is really the only option you have. If you can’t bear to see vinyl patches and your damaged vinyl deck has living space below it, you may need to replace it entirely. When you’re relying on a vinyl decking membrane as a roof, the risk of a poor patch job is too high. 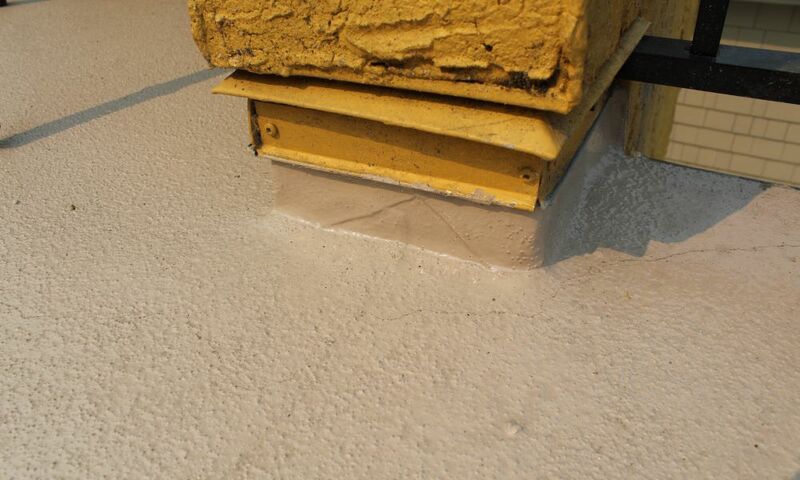 The cost of a new vinyl membrane will be much less than the cost of water damage if a sub-par repair results in a leak through the deck into your home. If you’re not sure what your best course of action is on your vinyl deck repair, call a trusted local deck builder. You can contact Citywide Sundecks in Vancouver, BC at 604-786-3325. Replacing a section of vinyl can solve waterproofing issues, but it can create an ugly blemish on your sundeck. With some practice (or expert help) there’s a way to create a small vinyl patch that blends more seamlessly into your deck. Unlike the traditional method of repairing a vinyl sundeck, using a small, seamless patch requires some skilled knifework. You can create this kind of patch with a scrap piece of vinyl that’s the same manufacturer and design as your existing vinyl. Grab a utility knife and extend the blade as far as possible. Put on protective gloves and eyewear and lay your scrap vinyl out on a cutting board. Hold the knife handle in one hand and the tip of the blade in your other hand. Gently bend the knife blade downward, being careful not to apply so much pressure that the blade breaks. Using the curved blade, scoop a patch of vinyl from the middle of the scrap piece. The object is to cut the vinyl patch in a way that the edges are tapered. WIth the right patch, you can create a waterproof patch with minimally visible seams. 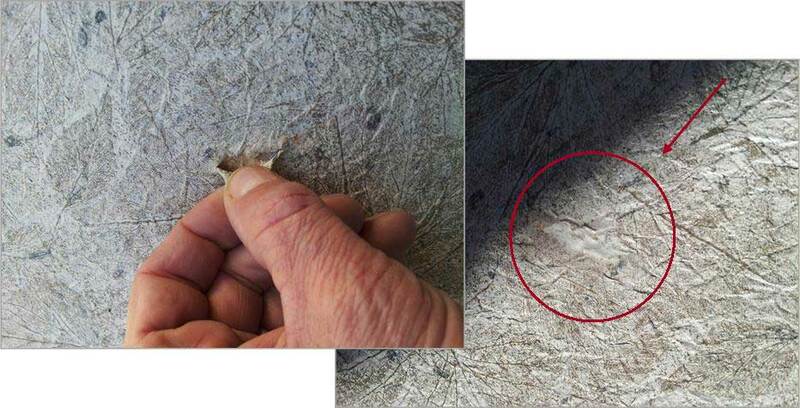 This type of patch is only realistic for burn holes or tears that are less than 1” in diameter or length. 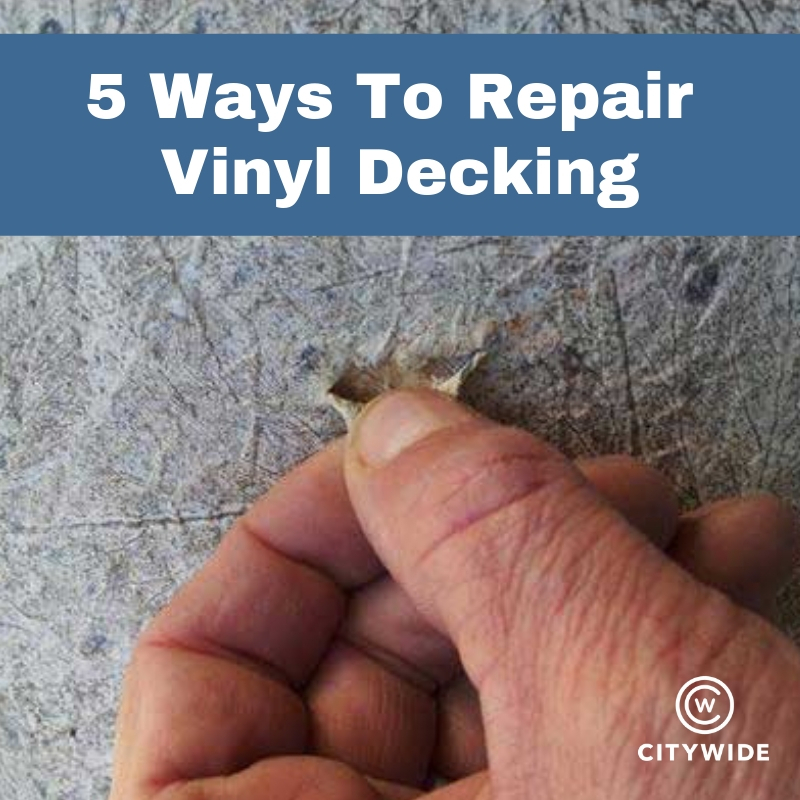 It’s a great option for creating a less-noticeable patch and salvaging your damaged vinyl deck without creating an eyesore or ripping the whole thing out. Because of the questionable strength of this type of unconventional patch, it’s also best used in low-traffic areas. Some well-placed furniture and outdoor area rugs can take a vinyl sundeck from looking worn out to outstanding. This tactic is an affordable alternative to completely replacing your vinyl deck and can also hep mask unsightly patches after a spot repair. 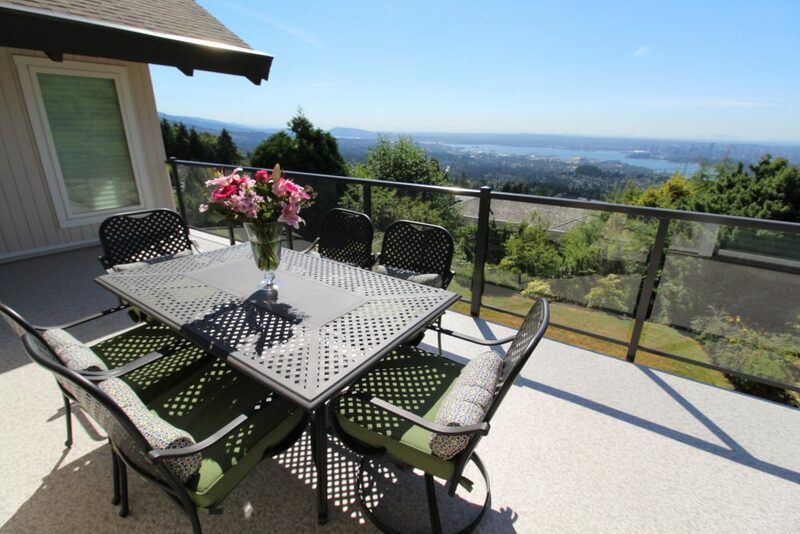 Get some Deck-spiration on the Citywide Sundecks Pinterest page. Or rather, apply a deck coating. When your deck is stained, faded, slippery, or just outdated, coating your sundeck with a custom deck coating is a simple way to solve your problem. You can extend the life of your vinyl deck and make it feel like new. A huge advantage to this deck coating is that if it’s ever worn down or stained, you can just add another coat to make it like new. When your vinyl needs some TLC, it’s wise to consider all your options for repair. Keep in mind that some manufacturer warranties can be compromised when a repair is DIYed. Before you move forward with any of these ways to repair vinyl decking, check your paperwork. You can also review a comparison of major vinyl manufacturer’s in our vinyl decking warranty comparison. If you could use the expertise of a pro to help with your vinyl deck repair, fill out the form below or call 604-786-3325 to reach the vinyl deck-sperts at Citywide Sundecks Vancouver.